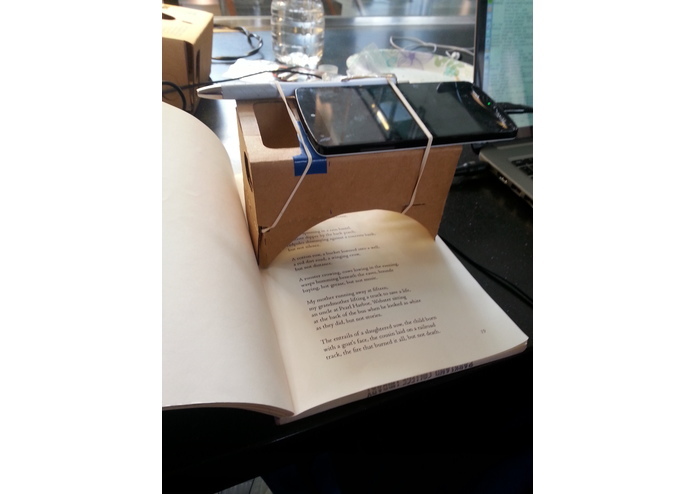 The process: place your phone onto the 50¢ scanner, speak 'Just Read', and the phone will begin taking a video. Scan the length of the page (which takes about eight seconds), and stop the video. The video will be fragmented into stills and stitched together into one picture. JustRead will extract the text from the picture, print out the text, and speak it out loud. 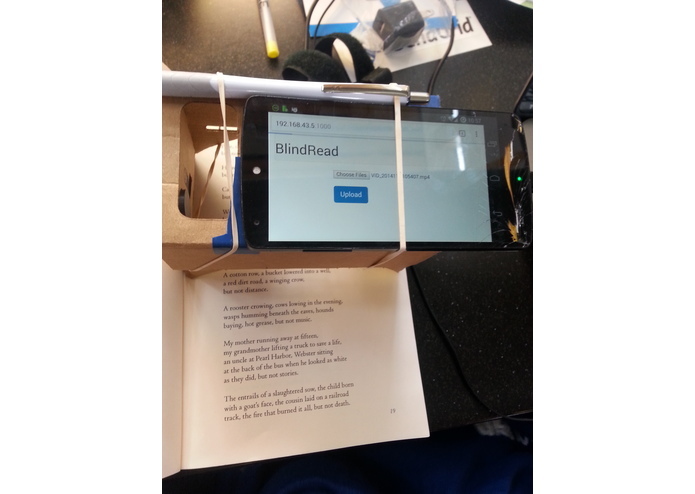 Users: Blind people: the JustRead scanner, carved out of Google Cardboard, is designed to fit up with the edges of a page such that a person doesn't even need to see the product to use it--perfect for the six million blind Americans who cannot read everyday documents that are not encoded in Braille or recorded as audio. First-generation immigrants: your daughter brings her 2nd grade homework to you, but you cannot understand the language enough to help her. Scan the page and read a translation without having to type a single word. Young readers: does your 2nd grader not know what a word sounds like? Does she need someone to read a passage to her? JustRead has it covered. We are proud of the whole thing! Opening up the world to people with disabilities is, clichés be damned, our passion. When we realized that JustRead could be used for much more than just the blind community, we were even more thrilled.